When digging around, we are bound to unearth something. Sometimes that something is what we were looking for and other times, maybe something better left alone. The case of the Van family who claims to descend from John Vann, son of John Shepard Vann and Elizabeth Pack Fields Coody Vann, is one such example. What someone seems to have done is dug around, found a Cherokee man with a similar name as their ancestor and then replaced their ancestor with that Cherokee man and invented a story and lineage that links them to the Cherokee Nation. The problem with this lineage is that, though invented, it is spreading across the internet like wildfire, and many people accept it as true. First, Elizabeth Pack Fields Coody Vann did not die during the Civil War. 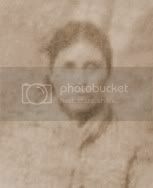 She lived until July 1893, as reported in the Eastern Cherokee applications of her two children, Ella F. Robinson (8704) and Charles E. Vann (9157). This means John Shepard Vann did not marry a white woman after the Civil War. He was still married to the living mother of his son, John. Though the descendants of Sarah Matilda Hines/Himes claim her husband was the Cherokee John Vann, who was the son of John S. Vann and Elizabeth Pack Fields, and that the Cherokee John Vann was the father of her children, this CANNOT be true. Sarah's oldest living child, a son, was born about 1886. There were several others born after him. The Cherokee John Vann died in 1879, therefore, he was dead approximately seven years before the birth of Sarah's oldest living child. It is not possible that he was the father of that child or any child that followed. The evidence that the Cherokee John Vann died in 1879 is readily available because his death caused quite a commotion at the time. He was killed in Muskogee during a time when there was a lot of conflict between the affluent Cherokee mixed bloods and the Creek freedmen who lived on opposite sides of the boundary between the Cherokee and Creek Nations. His death was so well documented, even a novice genealogist should have been able to find evidence of it. 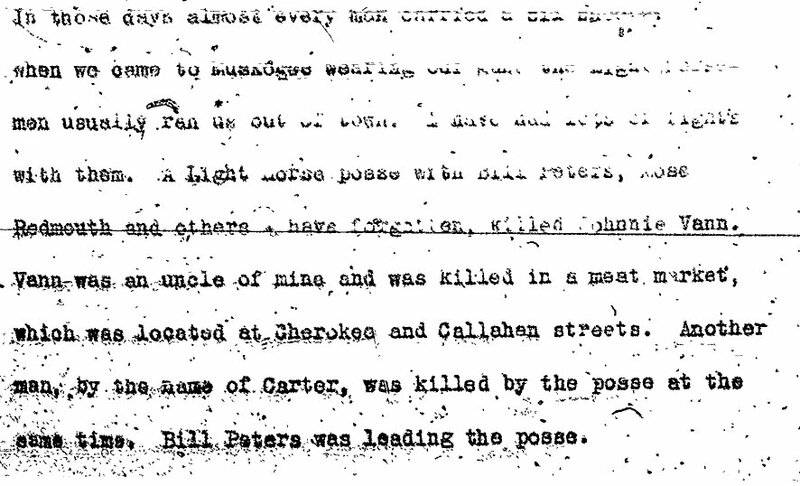 John's half sister, Ella F. Robinson, reported in her Eastern Cherokee application that he died without descent. 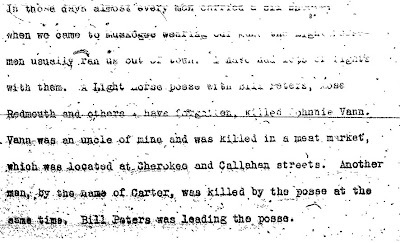 John's nephew, John C. Robinson, son of Ella, said in a WPA interview for the Indian-Pioneer History Project for Oklahoma that his uncle, Johnnie Vann, was killed in a meat market in Muskogee. Though those two pieces of information should make one question the claim of the Sarah M. Hines/Himes descendants, since Ella C. Robinson says her brother died without descent, no date is listed for his death, therefore, most genealogists would continue to dig for more documentation. Hopefully, they would turn up the last bit of information to clear up any doubt. It is found in a letter Elizabeth Pack Fields Coody Vann wrote to the chief of the Cherokee Nation after the death of her son. That letter shows that the entire story told by the descendants of Sarah M. Hines/Himes cannot be true. First, it shows the mother of John Vann did not die during the Civil War, since she is living 15 years after it ended. Secondly, it shows John Vann did not run away and have no further contact with his family. They knew where he was and what he was doing and were more than aware of the facts surrounding his death. And lastly, it gives the date, August 2, 1879, as the date of death of John Vann. The Vann family was affluent and well documented. It is difficult to believe such a glaring error could be made in their lineage, but unfortunately, one was. 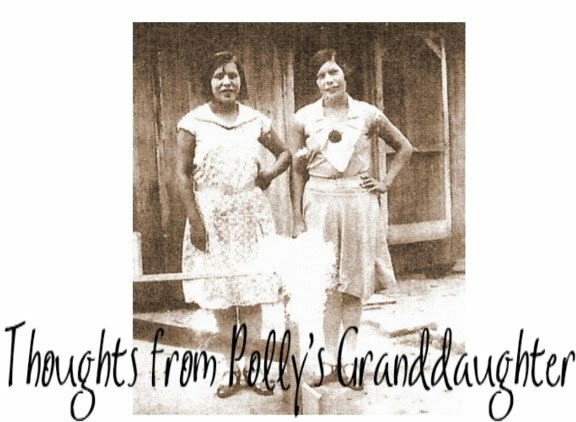 This case reveals many issues we have in Cherokee genealogy and what is accepted by some as true. It touches on some things that may shock people. Stay tuned for the next installment in the series, Destroying the Field - The Ramifications, to see how people digging up the bones of a Cherokee and claiming him as their own when he is not is very much an example of exhuming things that are better left alone. This reminds me of a Vann family that I'm working on for my cousin. In my cousin's family there is a Delilah Vann, b. 1785 TN & d. 24 Nov 1847 Overton Co., TN. Now on Ancestry.com many have this Delilah as the daughter of James Vann and Elizabeth Scott and that she married Stephen Copeland. However, I have found that there are two Delilah Vanns born about the same time. There is this one that belongs to my cousin's family and there is Delilah Amelia Vann, b. 1785 GA who married David McNair. This 2nd Delilah is the real daughter of James Vann and Elizabeth Scott. My cousin's Delilah belongs to somebody else. I'm not saying that she is not somehow related, perhaps a distant cousin. But what I am saying is that some people have mistakenly placed her with the wrong parents. And probably trying to prove her Cherokee heritage. This is why it is so important to weigh in all of the evidence. And then you must accept the results whether you like them or not.